TC and I love gadgets. And are always game to try new and interesting things. But to have a guy who designs kitchens for a living tell us that WE had a lot of gadgets? Well … that must mean something! The other day, my nephew Ethan came to spend the afternoon with us. It was unexpected and all I had planned for dinner was Beef Bulgogi and stir fried French Beans (my favourite!). But instead of frying the beef, I decided to take out our Breville Professional 800 Collection Grill and let the kids have a go at cooking their own dinner. They knocked 7 eggs into a Tupperware Stor N’ Pour, threw in some salt, shook it up and made omelettes on the flat side of the grill, and grilled the beef on the ribbed plate. At the end of the dinner, my nephew declared it was the best dinner he had ever had! 😀 A bit of an exaggeration I’m sure, given that this boy has eaten in more restaurants than I have, and in more countries than I have visited! We use the grill at least once a week, when we do our grilled sandwiches for lunch. We also take it out to toast bread (I don’t have a toaster), to make pancakes (fabulous! ), to grill fish and chicken (contact grill does it in half the time!) and to re-heat pizza. It is coated with Quantanium, which I believe is like Teflon only better. 🙂 Unless you are planning to heat it in excess of 500 degrees, the research is that it is safe and not carcinogenic. The grill can be used as a sandwich press (makes these lovely diagonal lines on your sandwich which make them look very “deli-style”), as a contact grill (press it down over meat and fish and it cooks both sides together, saving time! 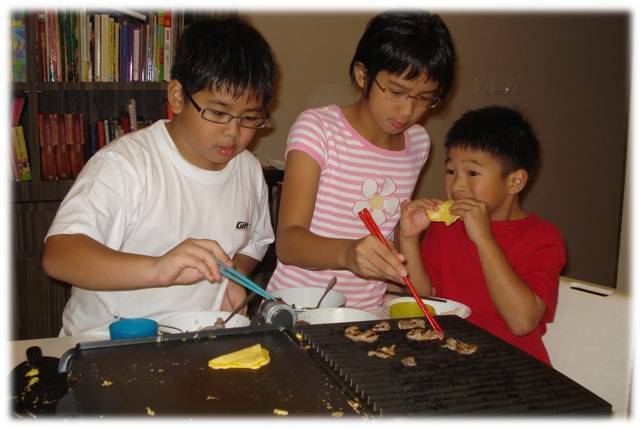 ), and it can be opened out to double the grill surface which is what you see in the photo with the kids grilling. The only downside of the grill is that the grill plates cannot be removed to wash. But they clean very well and fairly easily with kitchen towels. We wipe them down when the grill is still hot, using hot water if necessary. This time round, though, there were quite a few burnt bits stuck on the ribbed plate, so cleaning took a little longer. 🙂 But it was well worth it to see them have so much fun preparing their own food! We bought our grill from Pantry Magic at Holland Village. We paid S$345. It has been a “NO REGRET” buy. We bought it just over a year ago. A friend was coming over with his family and they wanted to barbecue. But I was HUGELY pregnant at the time, and wasn’t keen on standing around downstairs around a hot barbecue pit. So we bought this to have an indoor barbecue and it was a hit! Oh, I’ve been thinking of buying a grill for a long time but just cannot decide on which one to buy. Now, this blog sure helped!